- A small retconning issue occurs here, the president says "years" in this episode, but in future episodes the term "yahren" will be used to refer to years. - You've got to wonder why the Cylons have ships with atmospheres and artificial gravity if they're just machines. You've also got to wonder why their fighters aren't robots themselves. Why have a robot pilot a ship when you can just make the ship a robot? - Apollo takes his father to the surface in his Viper. Okay... how? They're single seat aircraft. - Adama says Earth is located beyond the planetary system of the colonials. He also says it's in a galaxy very much like their own. So which is it? In another planetary system or in another galaxy? The RTF is not capable of traveling at FTL speeds from what we can tell. This is especially evident if they've been confined to a single planetary system. So how are they going to cross galaxies? For that matter, how they going to reach another planetary system? This is an extremely large plot hole which plagues the entire series. - The name "Battlestar" is derived from the US military. A "battle star" is given to a US warship after it has seen combat. - Patrick Macnee, who tells the opening lines of the show, also is the voice of the Cylon Imperious Leader. - BSG 1978 takes place in the "7th millennium of time" according to the president of the colonies. - According to the president, this would have been the first peace man has ever known in a thousand years. This implies that the Cylon war may have lasted 1000 years. - A line from Tigh suggests that the Cylon homeworld is in fact named "Cylon." - Tigh at one point says, "my god!" which suggests the colonials are monotheistic, or at least whatever colony Tigh is from is monotheistic. - Commander Adama's wife was named Ila. - The ragtag fleet (hereafter referred to as RTF) is made up of 220 ships. - According to Adama, the colonials descended from a mother civilization on a single planet which went out into space and founded the colonies. - Among colonial society there are people called "socialators" which would be our equivalent to a prostitute, except legal and somewhat less slutty. Though the episode does imply they're considered dishonorable at least by some members of colonial society. - "There are those who believe that life here began out there. Far across the universe. With tribes of humans who may have been the forefathers of the Egyptians, or the Toltecs, or the Mayans. That they may have been the architects of the Great Pyramids. Or the lost civilizations of Lemuria. Or Atlantis. Some believe that there may yet be brothers of man who even now fight to survive somewhere beyond the heavens." The first words spoken in the series, a narrative read by Patrick Macnee. - Apollo and Zac battling the Cylons. - The Cylons killing Zac. - The Galactica engaging the Cylon fleet. - The Cylons destroying the Atlantia. 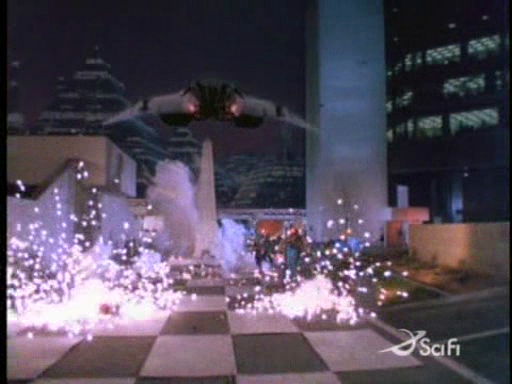 - The Cylons attacking Caprica. - Apollo overlooking a destroyed coastal city below him on Caprica. - The revelation that the Battlestar Galactica is the only surviving Battlestar. - I like the scene where Apollo, Starbuck, and Boomer confront the hungry, angry, suffering refugees. Part one of Battlestar Galactica's pilot was really a great episode of TV, especially for its time. Here we are beginning a story that is truly epic and very dark. An entire civilization is wiped out, minus a smattering of ships full of refugees. With their enemy in hot pursuit, where will they go and how will they survive? It's this dark premise that gives the show it's immense charm. In addition to that, the episode is complimented well with top notch (for the time) special effects and a wonderfully performed musical score. Unfortunately, even in part one of the pilot the show starts exerting extensive plot holes and logical flaws. Among the technical problems listed in the problems section of this review, there's something just too far fetched about a society that's been at war for a thousand years being defeated so swiftly and completely. There's nothing technically wrong with that as it is presented in the story; such events really could occur, despite how unlikely it is. It's just that the military tactics used by the colonials in this episode were extraordinarily bad and you'd think a thousand years of war would make them have a better understanding of strategy. All science fiction shows require suspension of disbelief, but this is pushing it. Case in point, the president was a moron. 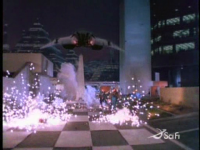 The Galactica's vipers are under attack early in the episode and the president orders the Galactica to ignore it? Who cares what the political situation is? When you are attacked, you defend yourself. Period. Fortunately, the show makes a pretty good point of voicing the various characters' discontent. Logical and technical problems aside, Saga of a Star World, Part 1 comes off strong. It's exciting, it's generally interesting, and it's better than most everything else made during its time. So I sat down to eat supper tonight and dialed up something to watch on demand from Netflix. One of the play-now options suggested to me was the original Battlestar Galactica complete series. I watched the show as a child, turning up my nascent Trekkie nose at it even then, but secretly liking it nonetheless despite its inherent goofiness. I know the new series has a completely different feel, and is by all accounts a good re-fitting of the oringinal concept, but I've never really given it a shot. So I figured I'd re-watch the original for the first time in 25 years and enjoy it the same way I would enjoy, say, "Plan 9 From Outer Space" or that god-awful 70s Buck Rogers show with the midget robot. And I did enjoy that way. The dogfight scenes and the atari controls on the fighter ships were priceless. Lorne Greene as Captain Adama looks like he thinks he's playing an emotionless Vulcan but really he's just that wooden. The council of 12 look like angels in a movie where George Burns plays God. In the first episode, Athena has four scenes. In two of them the camera focused on her just long enough for her to burst out in tears, in one of them she has a nervous breakdown, and in the final one she's half naked and telling Starbuck that she can't date him because she doesn't want to lose him like she lost her brother WHO JUST FRACKING DIED. This is an inherent problem with this series, it seems. Scanning ahead in the reviews posted here, it seems that I'm not the only one who thinks the Battlestar crew is a little cavalier about the destruction of their planet and all hte other colonies. Another thing that strikes me about this series is what god-awful pilots the Cylon Centurions are. However, once I got past the general corniness, I was shocked by how decent the show was. The Cylons (I never realized as a kid that they were patterned on the Roman Empire) were interesting and iconic, if completely dated in appearence. And the concept of the show (I was a bit fuzzy on this) which begins with the devastation of the human race everywhere except Earth, was really cool. The idea and the story itself were actually very intriguing. So I continued watching, wondering if I'd misjudged Battlestar Galactica this whole time. Then came the robot dog.